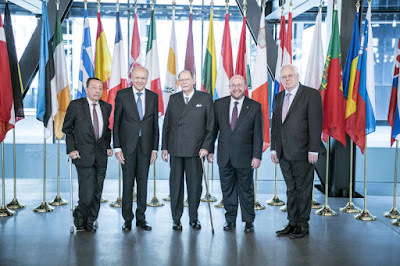 On Monday, Grand Duke Jean paid a visit to the Court of Justice of the European Union. The highest court in the European Union in matters of European Union law is situated in Luxembourg. His Royal Highness was welcomed by members of both the Court of Justice and the General Court, from left above: Marc Jaeger, President of the General Court, Koen Lenaerts, President of the Court of Justice, François Biltgen, judge at the Court of Justice, and Dean Spielmann, judge at the General Court.